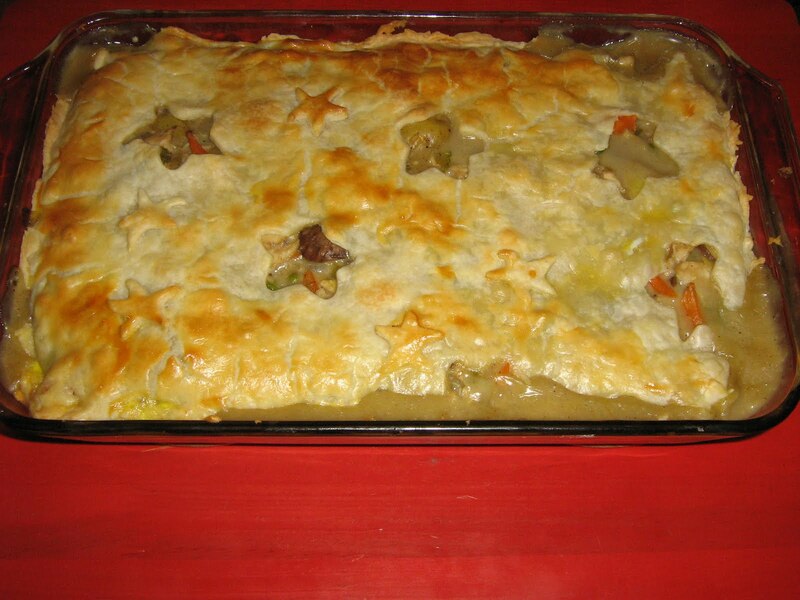 Tonight’s dinner was inspired by Glen from work, who described his experience with M & M Meats’ beef and chicken pot pie. Summary: Buy the chicken pie, skip the beef pie. If you don’t have a free afternoon to make one yourself from scratch, as I do today (bliss!!! 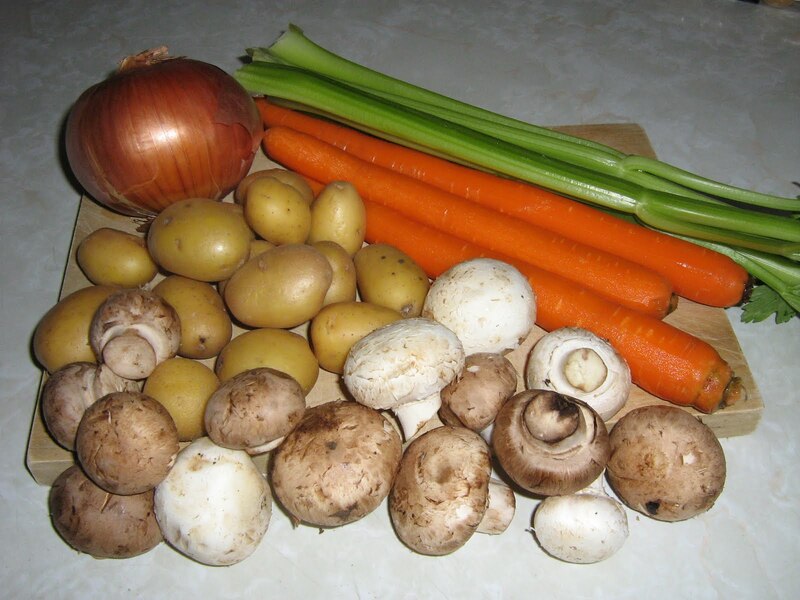 ), and are craving a pot pie, then I heartily recommend you visit Old Country Meat and Deli at 6328 – 106 Street (Edmonton). Todd Panchuck has the best of ye olde English meats…. proper rashers, sausage, blood pudding, meat pies, and sausage rolls. If you are Englishy, you already know of this place. To the rest of you, I’ve just let you in on a secret. Back to Glen. His story reminded me that I had frozen left over turkey intended for turkey pot pie. The turkey has been in the freezer nearing 30 days, it was time to set it free. Now I have been known to create recipes using my own wits, but somethings, like pot pie, I need a bit of guidance, so I consulted with my cookbook library. A trusted source is Elizabeth Baird and her cookbook The Canadian Living Cookbook. What I like is the flexibility with the recipes. For instance, for the chicken pot pie, you have a choice of a biscuit, dumping, phyllo or pastry topping. I went with a regular pastry crust. Don’t ask me if I made the pastry myself. I won’t have to lie in return. While I was chatting on this phone this afternoon, I was sampling the filling even before it hit the casserole dish. It was delicious. It’s surprising there’s any filling left for the pie. But enough survived, and it’s a perfect late afternoon lunch for a blustery snowy day like today! Next Post Cake! There’s Cake this Year!! 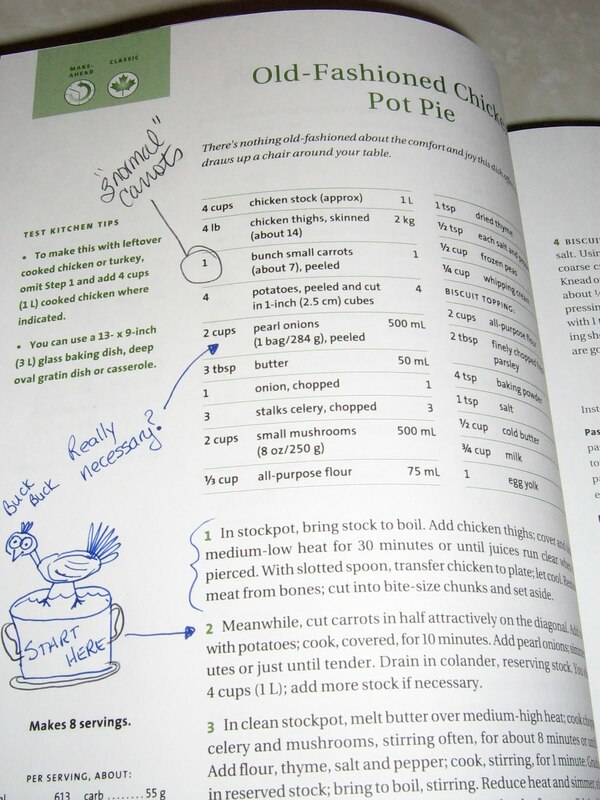 Ha ha, I like your doodles and annotations to the cookbook recipe! I love this particular recipe, I omit the pearl onions as I find them a pain to peel. I usually make the biscuit topping as that is what the family likes best. Yay! Thanks for the feedback. Love reading the comments. Nice to know there's people out there reading this thing.Jenny, by your request, I have added a link to the entire recipe. Found it in Google books. In the text of my blog, click on the link The Canadian Living Cookbook. Like magic, it will take you to the recipe.